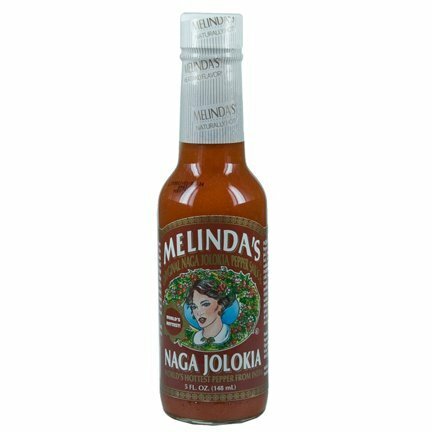 Melinda's Naga Jolokia Pepper Sauce (5oz./148ml): Melinda's Original Naga Jolokia Pepper Sauce is pure heat. Our hottest offering by far, the Naga jolokia is confirmed by the Guinness Book of Recrods to be the hottest chili in the world (1,041,427 Scoville Units), unseating the Red Savina for the title. Also know as the Bhut Jolokia (Ghost Chile), the Raja Mirchi (King Chile) and the Naga Morich, this chile is grown primarily in the Northeastern region of India. The names are different depending on the region, however, one thing remains the same-these peppers are hot and should be consumed with caution. Ingredients: Naga Jolokia Peppers, carrots, papayas, lime juice, vinegar, onions, passion fruit, citric acid, garlic, salt, xanthan gum. If you have any questions about this product by Melinda's, contact us by completing and submitting the form below. If you are looking for a specif part number, please include it with your message.